There are a lot of people who rely on nonstick sprays when cooking, however, one of the problems with that is those sprays tend to change the taste of whatever it is that’s being prepared. As a result what we’ve figured out is the best way to get around the problem of having food stick to the pan it’s being cooked in is to use a high-quality nonstick skillet. To help you know which skillet to purchase we’ve compiled the best nonstick skillet list. It is a list of the best nonstick skillets on the market today. In the article below each of the skillets is reviewed as we note what the best features are about each skillet. After looking at several skillets we have concluded that the best nonstick skillet is the Tramontina Professional Aluminum Nonstick Restaurant Fry Pan so we’ll start our reviews with that one. We can’t start a review about the Tramontina 80114/535DS Nonstick Restaurant Fry Pan without first pointing out just how well-built it is. It is made from a very heavy aluminum material. This makes it extremely strong and virtually indestructible. While a lot of nonstick skillets are prone to be damaged and easily scratched this skillet is not. Because of the fact that skillets are often used things like spatulas and forks scratching is often the biggest concern. A secondary concern is whether or not the skillet is one that will heat up evenly. Whether or not a skillet heats evenly is the first sign of how well made it is as all well-made cookware will definitely heat up properly. This is something that is not a problem at all with the Tramontina 80114/535DS Nonstick Restaurant Fry Pan. It cooks your food perfectly by heating up both quickly and evenly. There is no doubt however that the most important feature of any nonstick skillet is the nonstick surface. 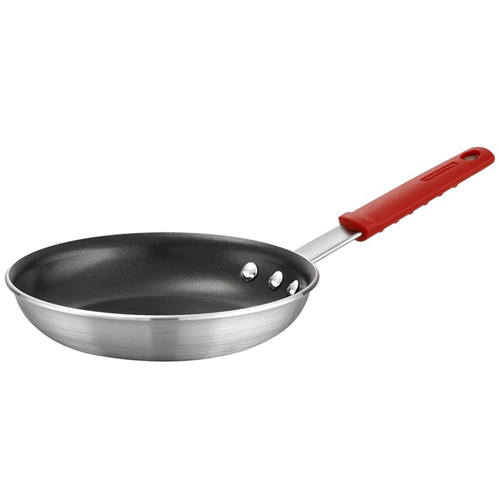 The nonstick surface on this pan is made with a PFOA-free coating and works very well. Eclipse is a widely used and well known non-toxic spray that’s both safe and effective for ensuring food does not stick to surfaces it has been applied to. On top of being very good at preventing sticking it also gives you a wide range of versatility since it is both oven and dishwasher safe. It’s able to withstand temperatures of up to 400 degrees and can be put in the dishwasher or oven. This also means you can start cooking things on the stove with it and finish them off in the oven if you want to. The Tramontina 80114/535DS Nonstick Restaurant Fry Pan is available in 4 unique sizes, from 8 to 14 inches. And they’re all priced so affordable that it’s entirely possible to buy yourself the whole set. One more important feature of this nonstick skillet is the handle. Having a good handle on your nonstick skillet is probably one of the most important overlooked features around when it comes to considering a new nonstick skillet. The Tramontina 80114/535DS Nonstick Restaurant Fry Pan comes with the soft, comfort grip handle that you can remove easily for cleaning. And it also has a hole right in it to make storage simple and easy. – Nonstick coating by Eclipse. – Available in 4 unique sizes. – If you want a lid you’ll have to purchase it separately. The Vesuvio Ceramic Coated Nonstick Frying Pan is easily our 2nd choice for the best nonstick skillet. Not only is this a really well-made skillet but it is also a very good skillet all the way around. This is such a great all around skillet that it’s difficult to know what to start with when it comes to pointing out its best features. With that being the case we’ll start by talking about how well built it is. 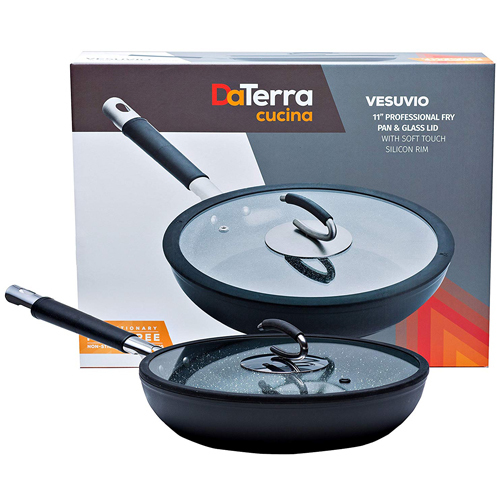 As you probably gathered from the name, the Vesuvio Ceramic Coated Nonstick Frying Pan is made in Italy. It’s made with high-quality aluminum on the outside and uses a special long lasting ceramic coating. 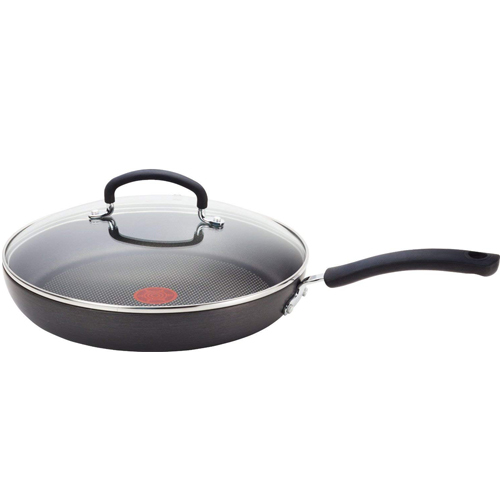 The heavy duty aluminum construction and ceramic coating ensure that the skillet will always heat up evenly. Proper heating is extremely important when using a skillet. 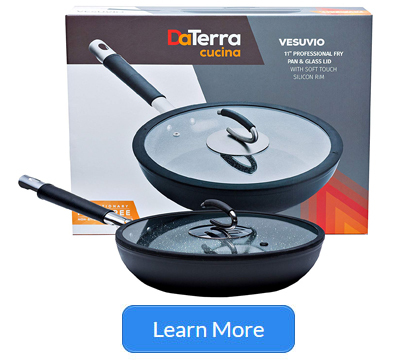 If you have environmental and health concerns that you take into consideration the Vesuvio Ceramic Coated Nonstick Frying Pan also accounts for those by not using any lead in it. It is made from 100% recyclable aluminum. You can cook safely and freely knowing that there is no PFOA or PTFE in the nonstick coating either. There need be no concern of having any harmful chemicals being leached into any of the food you cook with the Vesuvio Ceramic Coated Nonstick Frying Pan. The handle is also extremely well designed with a comfort grip that remains cool to the touch even when used in extremely hot conditions. One other feature of note with the Vesuvio Ceramic Coated Nonstick Frying Pan is that it comes complete with a lid. This is a very nice feature to have included since a great many nonstick skillets do not typically come with a lid. And it’s also a high quality, well-designed lid and not just something that has been thrown in so they can check the box saying it’s included. – The very sturdy construction. – No harmful chemicals have been used in the making of this skillet. – The ceramic coating that coats the interior of the skillet is really high-quality material. – Comes complete with its own lid. – It is an expensive nonstick skillet. Although not the one we chose for best nonstick skillet, the Alpha Frying Pan, with Stone Ceramic Marble Coated Nonstick Skillet is definitely one we’re sure any cook would be happy to have. The first thing we have to point out is the nonstick coating it has. It’s made with the familiar and popular ceramic option. 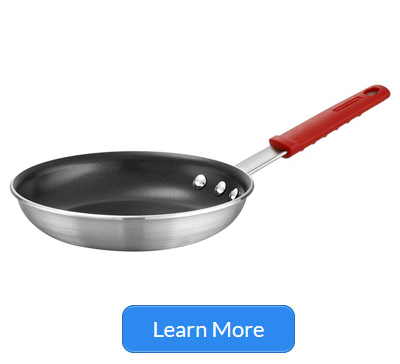 What makes the Alpha Frying Pan, with Stone Ceramic Marble Coated Nonstick Skillet special is how many times the nonstick coating is actually applied. It is applied to the whole interior of the skillet 6 different times. This is an important distinction because it is what ensures that it lasts for a very long time. If the nonstick coating weren’t applied 6 times it would not last as long. It’s also a well-designed skillet. Made to heat evenly and also be easy to use. The handle is a sturdy design and is made in such a way that you’re able to easily flip different types of foods you’ll be cooking without involving a spatula. It even has some special details, like a thumb rest, that will allow you to hold and handle your skillet just like a professional chef would. 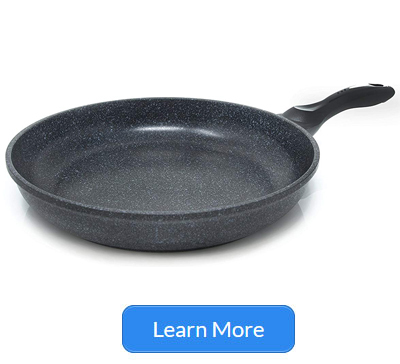 Because the Alpha Frying Pan, with Stone Ceramic Marble Coated, does not have any toxic materials you don’t have to be concerned about hazardous things leaching into the food you’re preparing. This is a very worthy addition to our best nonstick skillet list. – The skillet’s interior has 6 layers of nonstick coating. – The handle is comfortable and easy to use. – The great design ensures that it always heats evenly. – No harmful components used during construction. – Does not include a lid. – Cannot handle high temperatures. 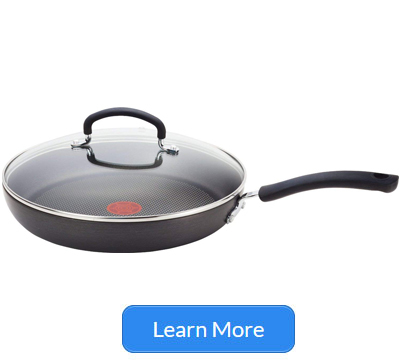 T-fal is one of the better know cookware manufacturers with a great reputation, so probably comes as no surprise that we’ve included a product from them on our best nonstick skillet list. 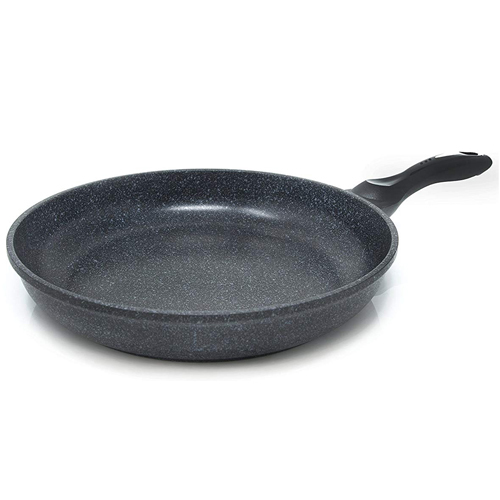 What makes this particular skillet great is the fact that it has a well-built aluminum base. This makes for a product that is very durable and will last a very long time. You don’t have to be overly concerned with your skillet being scratched or otherwise damaged. It’s interior is equally as well built. They’ve used a nonstick titanium coating that will easily last for years and years and is also able to withstand temperatures of 400 degrees. It is also specially designed so it won’t warp even when it’s continuously exposed to high temperatures. We have to say that by far one of the best features of the T-fal skillet is that it has a thermo-spot heat indicator. This is a red mark right in the center of the pan that glows when the pan is perfectly heated. This will really come in handy during those times when you need to be very precise with your cooking. And finally, this is a nonstick skillet that comes with a perfectly fitted glass lid. – A fitted lid is included. – Made with very durable aluminum. – The thermo-spot indicator makes very accurate cooking extremely easy. – It is heat resistant. – It is a little hard to clean. The last nonstick skillet we’re going to look at for the best nonstick skillet is the TECHEF Frying Pan, Coated with New Teflon Nonstick Skillet. Just like the others on our list this too is a very high-quality product that anyone doing some cooking will be delighted to add to the collection of pots and pans. This skillets base is constructed from stainless steel and this helps in the prevention of warping and also with durability. It’s also good for ensuring that it heats evenly. The skillets exterior has been made with heavy-gauge aluminum and is also extremely durable as well. It comes with a handle that is brushed steel which is good for durability and remaining cool to the touch even when it’s placed near heat. 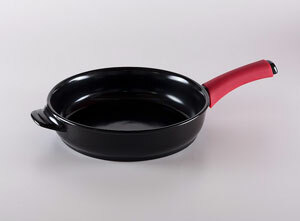 This skillet’s cooking surface is coated with Teflon and we would usually suggest that you not use a nonstick skillet coated with Teflon, however, based on TECHEF’s reliability and assurances that there are no harmful chemicals involved we believe this to be somewhere we can make an exception. – The handle is brushed steel so it always stays cool. – The skillet’s interior has been coated with PFOA-free spray. 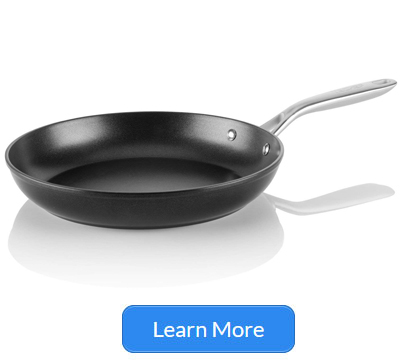 – The handle is not as comfortable as the others on the best nonstick skillet list. Since you have now read each of the reviews and looked at the best nonstick skillet list you’re better able to make an informed decision on which nonstick skillet is going to be the best one for you. We understand that some readers will want to know how we went about choosing the skillets that made our list. Others will want to know more about which features a good nonstick skillet must have. There is certainly a wide variety of nonstick skillets available for purchase on the market and if you don’t know what to look you could end up choosing a skillet that does not meet your needs. And even worse you could end up with a skillet that is of lesser quality which could mean it will last only a short time. On the other hand, if you head out shopping with plenty of information and knowledge it will certainly help you make a choice that you’ll be happy with when it comes to buying the best nonstick skillet for you. One of the most difficult tasks someone shopping for a nonstick skillet has is figuring out if the nonstick surface of a skillet is of high quality. The truth is you’re really not able to literally test the nonstick surface right there in the store. There are a few things you can watch for the will let you know if you’re looking at a high-quality nonstick skillet that is going to last for a reasonable amount of time. You definitely want to pay more attention to the skillets that say they use Eclipse nonstick coating. Eclipse is the coating that is sprayed on skillets to make them nonstick. Eclipse is really a fantastic product that makes a skillet retain its nonstick qualities for a longer period of time. Eclipse nonstick coating is what is used on a lot of nonstick skillets. Because we made the Tramontina skillet the best nonstick skillet on our list and it uses Eclipse coating it’s probably clear that we rate it very highly. So when you go out shopping for nonstick skillets we recommend that you look for a skillet with Eclipse coating. If you’re not able to find one that you like that uses Eclipse coating, there are some other things you can look for to be sure you’re getting a high-quality skillet. One alternative would be skillets that are ceramic coated as they’ll tend to retain their nonstick properties for a long time as well. One other thing that might be good to take note of is the temperature that the skillet you’re considering can handle. Low quality nonstick skillets aren’t able to handle the higher temperatures because it decreases the effectiveness of the nonstick coating. So, if you come across a skillet that is advertised to be able to handle a high temperature that’s a good sign it’s a high-quality skillet. Just to give you a point or reference, the skillet we chose as the best nonstick skillet, the Tramontina 80114/535DS Nonstick Restaurant Fry Pan is able to operate just fine at around 400 degrees. If it were not a high-quality skillet it could not possibly handle temperatures that high. To wrap things up, you should be sure to avoid buying a nonstick skillet that uses PFOA and PTFE if you can. These are chemicals that are commonly referred to as Teflon. People have recently started to turn away from these types of chemicals because there is concern that they remain in the body for extended periods of time, which some research has shown could increase the chances of developing certain types of cancer. 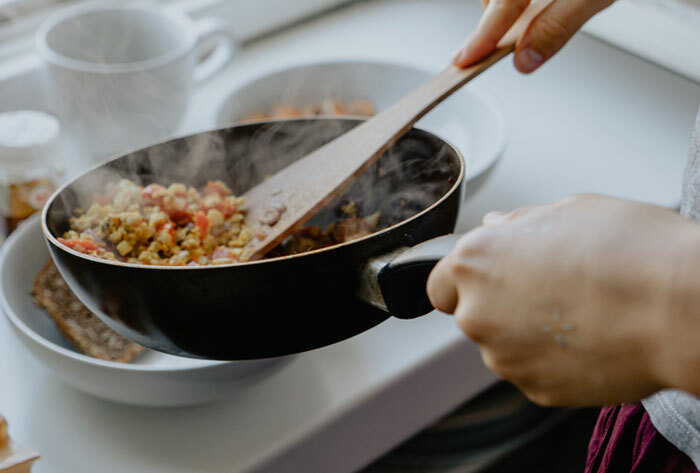 Most of the high-quality nonstick skillets are now making it a point to not use these chemicals when making their skillets. As an example, the Vesuvio and the Tramontina that are on the best nonstick skillet list have both made it a point to emphasize that they don’t use either of the two chemicals just mentioned at all. Therefore just to be safe we’re suggesting you not buy skillets that use these chemicals in the nonstick lining. One last point is to remind you to ensure that the handle on the skillet you’re considering is of the highest quality. You want it to have at least some sort of comfort grip so that you can hold the skillet safely as well as comfortably. 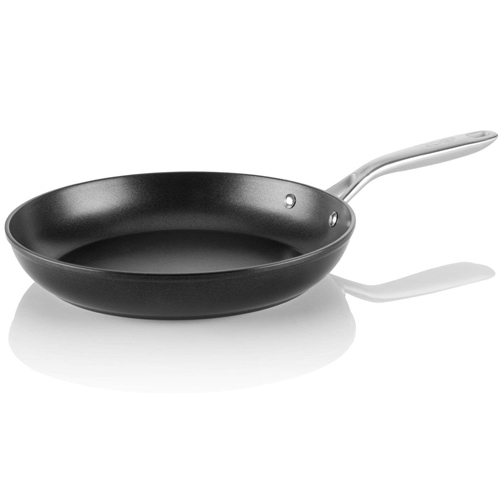 You should be aware that nonstick skillets tend to be more vulnerable to scratches due to the coating that they receive. Should the skillet receive a deep scratch it will damage the skillet and cause it not to work as well as it could. Making sure your skillet has an easy to grip handle will lessen the chance of damaging it because of dropping it. Also, when using a high-quality nonstick skillet you’ll be able to prepare some foods without the use of a spatula. This will also lessen the opportunity to damage your skillet. Since when the food item is done you simply slide it from the skillet right to the plate. No scraping necessary. We hope you find our best nonstick skillet list helpful. If you have thoughts about any of the skillets on the list or feel we’ve missed something about one of them please don’t hesitate to get in touch.